Poppies at Play: Piece of Cake! I have to let you know about this jackpot blog named Piece of Cake. It's my Sis-in-Law Val's blog. Val used to teach school and she has taught preschool. She has amazingly fun ideas all the time and has created a blog to share all of her goodness. She has activities for your kids to do for holidays plus tips on helping them learn to read and a whole lot of other cool stuff. 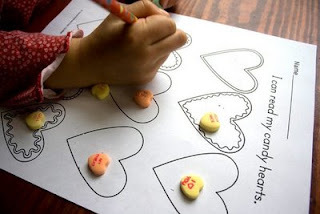 This morning we are doing some of her fun Valentines ideas! It really is a very helpful site. An unpainted Rose would be $115. I was lucky enough to find the other shelf at Deseret Industries in their "as is" department. I really love it! Oh man, Your SIL's blog is private! Do you know of any other fabulous "preschool" type blogs?